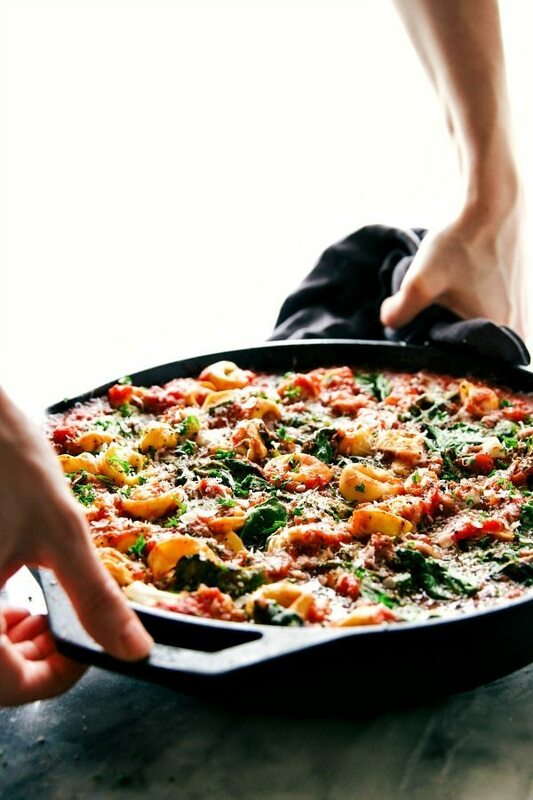 A super easy, 15-minute prep, ONE SKILLET tomato tortellini with sausage. 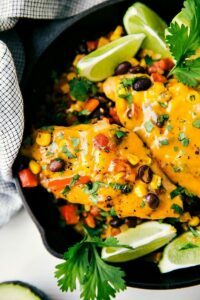 This is an easy family-friendly meal! Comfort food on Mondays. It’s a new thing that I’m going to be keeping up for-ev-er. Especially after having sick kiddos (and husband) all last week. This is just the meal to combat that crazy ever-changing Spring weather (seriously Utah, pick a season and stick to it ?) or just the general Monday blues. Although I’ll admit, I actually love Mondays. New fresh start to the week and lots to get done. I’m ready! ?? 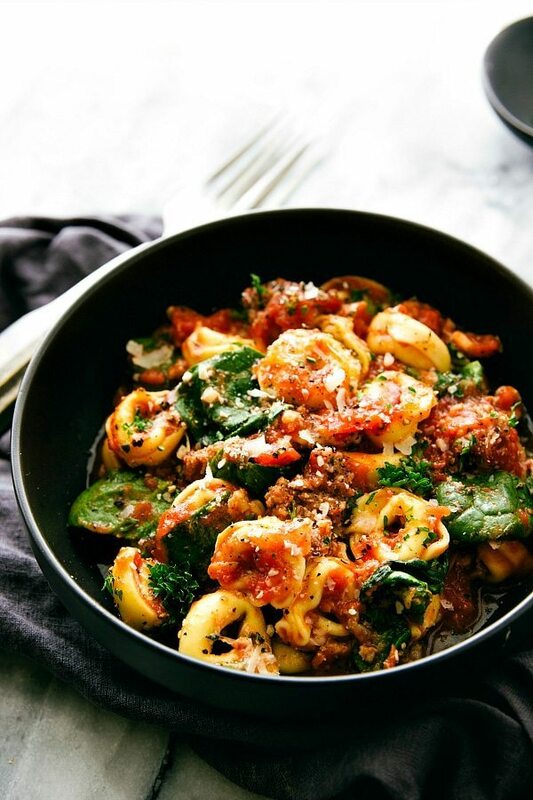 It’s no secret that we love tortellini. It’s been in quite a few recipes here and to be honest, it’s probably our dinner at least every other week. We LOVE tortellini. For some reason the toddler thinks it tastes like pizza (I guess the cheese inside?) and he calls tortellini “mini pizzas” which actually sounds like: “min-knee peet-zas.” I’ve got to get some of the words he says recorded before he grows out of it. And I know just about every single toddler pronounces yellow like “lellow” but I just about die every time Grey says the word. Since our tortellini dinners are generally just boiling the noodles and serving them with a red sauce, I thought it was time to make something a little more interesting. BUT it still had to be just about as easy. AND it only takes one big skillet to make. Less dishes is another thing that your Monday needs. ✔️Saute the onion + garlic in olive oil and then add in the sausage. Cook through. 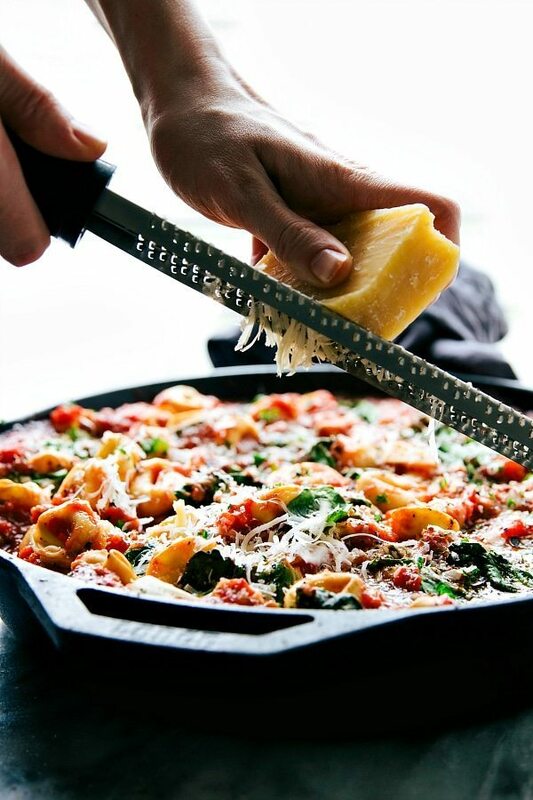 ✔️Stir in the UNCOOKED tortellini, spinach, spices, tomato sauce, and cheese. Yes, it’s really that easy! ? 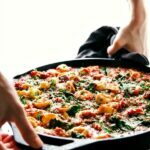 You will need a LARGE 12-inch skillet for this recipe. I use a 12-inch Lodge cast iron skillet and it works best in that. Dice an onion and mince the garlic. Pour the olive oil in the skillet and add in the onion. Cook over medium-high heat until translucent and then add in the garlic and stir for 20 seconds. Add in the sausage and cook until browned through. Drain off any extra grease. 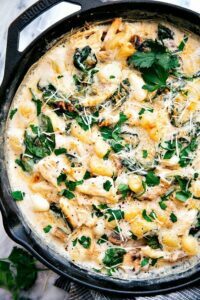 Add in two cans of crushed tomatoes, Italian seasoning (to taste preference, we used 2 teaspoons), uncooked frozen tortellini, grated mozzarella cheese, and spinach. 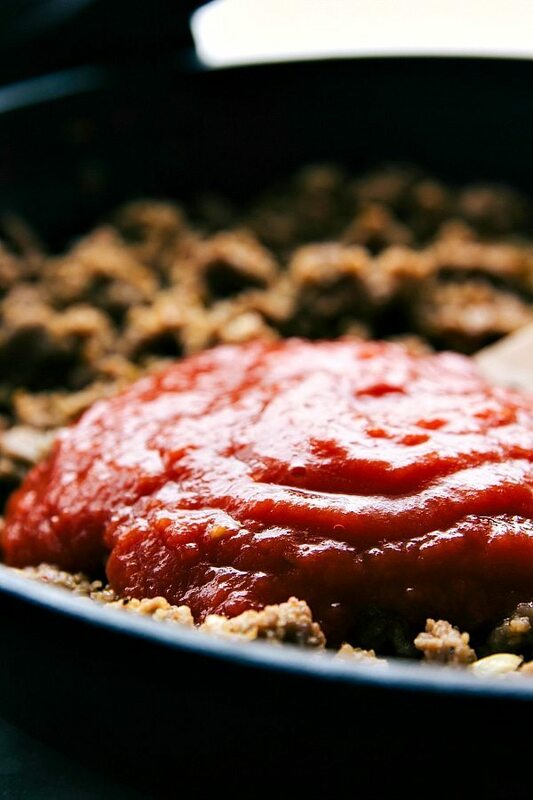 Stir to just mix things together and quickly press the tortellini's below/into the tomato mixture. Top with the Parmesan cheese, freshly cracked pepper, and a pinch of salt. Cook, uncovered, in the oven for 17-22 minutes. If desired, turn on the broiler and then broil for another 2-3 minutes for a delicious crispier tortellini. Remove from the heat and top with chopped fresh parsley if desired. Enjoy immediately. Thanks so much for your question, I clarified the instructions to hopefully make more sense 🙂 I hope you enjoy this dish! Amazing sausage, we usually use coconut oil for cooking. 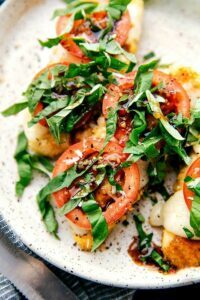 Got any taste difference while doing so,instead of olive oil as per said in ingredients of this recipe? 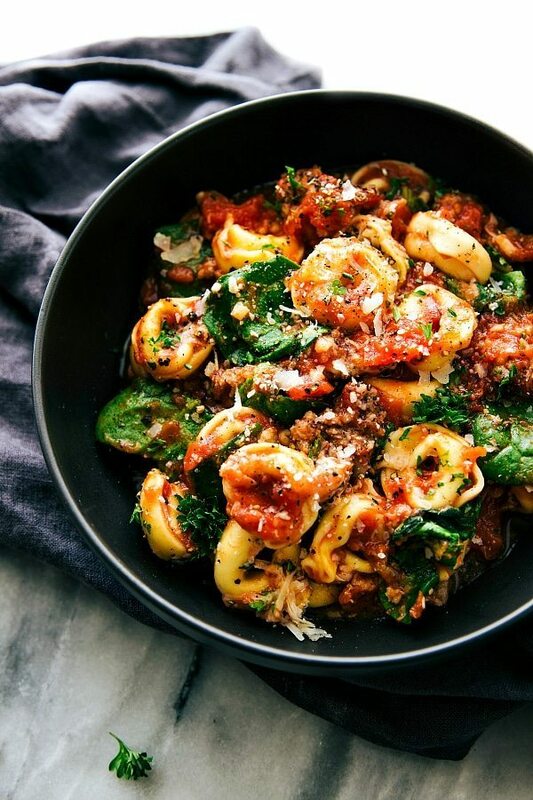 Could you use dry packaged tortellini instead of frozen? Or cook them first and add them when hot or room temperature? Thanks in advance! Made it for dinner and it was very good, easy and quick. Thanks Chelsea! What type of sausage do you recommend = sweet, mild? I don’t cook with sausage to often!